We had several little tastes of sort-of open street events today and it was great! Per the Open Streets Project: “Open streets initiatives temporarily close streets to automobile traffic, so that people may use them for walking, bicycling, dancing, playing, and socializing.” Here in Seattle we have Summer Parkways and if you can, get to Portland for one of their amazing Sunday Parkways. Or, of course, hit the original and bestest open street: Ciclovía in Bogotá. Anyhow, today was nothing like any of those, but getting a little dose of closed-to-cars streets is always a treat. 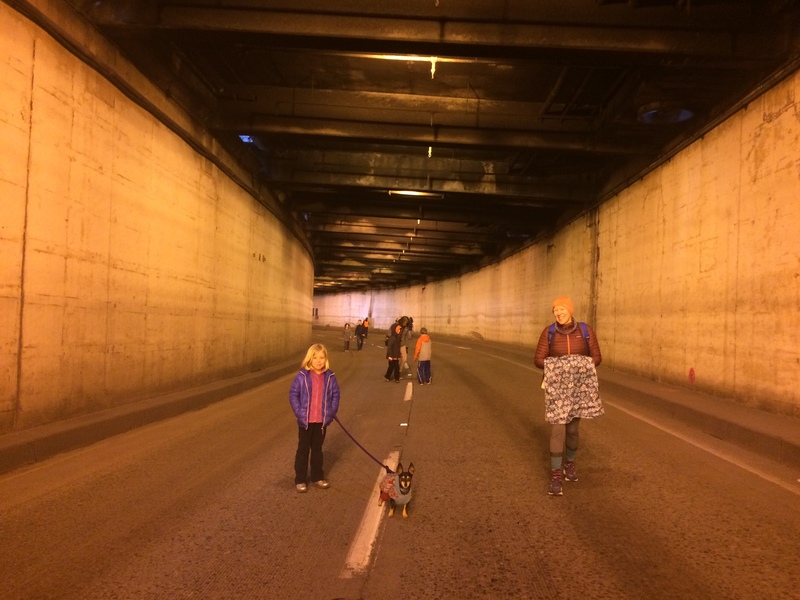 We had a nice 5.5-mile ride to the south end of the Battery Street Tunnel, but you’ll notice a jog as we encountered the Fremont Sunday Market (I always forget about avoiding that block on Sundays!) for our first open-but-not-open-to-pedaled-bikes street event. I really like the new flexipost-protected bike lanes between the Burke-Gilman Trail and Fremont Bridge, but they’re closed for the market on Sundays. 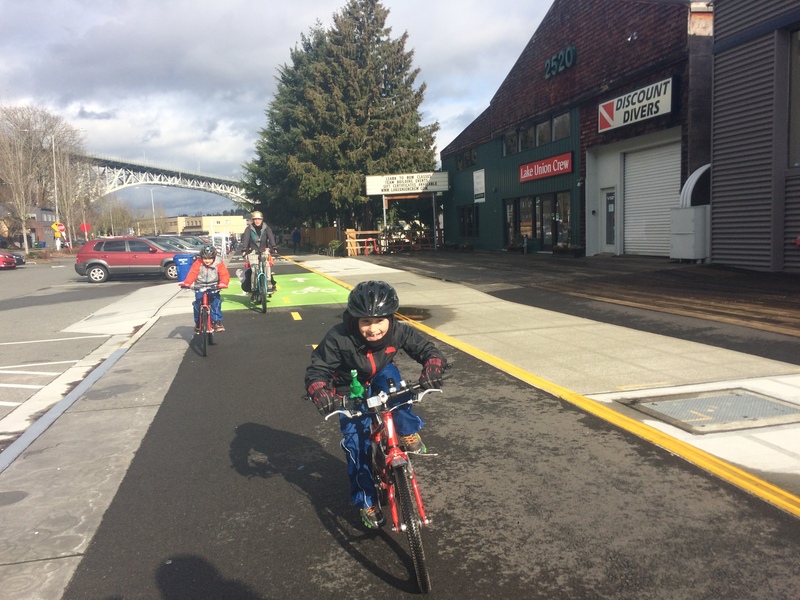 But before that we had a nice bit of Burke-Gilman Trail, and after that Ship Canal Trail and Westlake Bikeway–all wonderful spots for kids riding their own bikes. My two kids were on their own bikes and my friend Amy was on her Xtracycle EdgeRunner, carrying her kid and towing his single-speed bike, hoping to let him ride a bit on the way back. We took Dexter between the end of the Westlake Bikway and Bell Street Park (or as I like to call it, Bell Street Park for Cars, because no one heeds the arrow signs and turns off after a block). I don’t like taking Dexter Avenue on weekdays because the the paint-buffered bike lanes make them the perfect width for idling Uber private taxis. 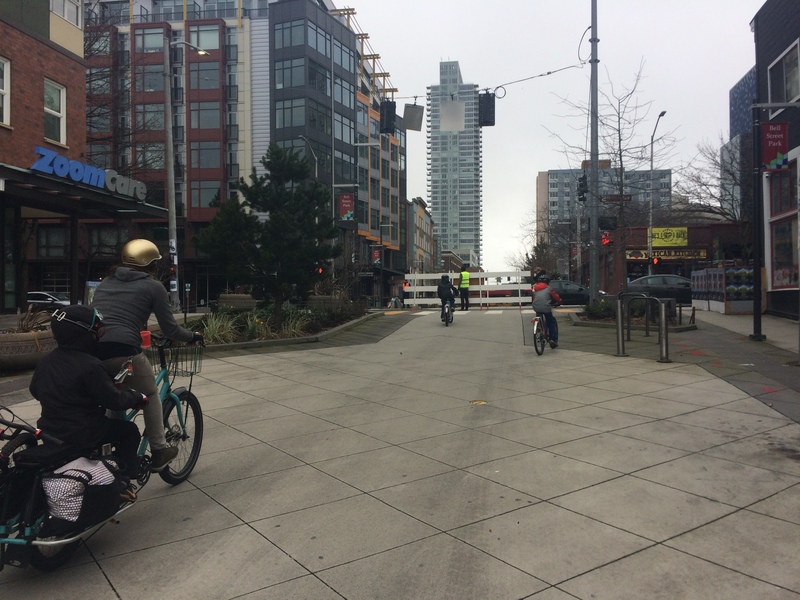 Weekends are better, though there are still several construction spots where the bike lane disappears. 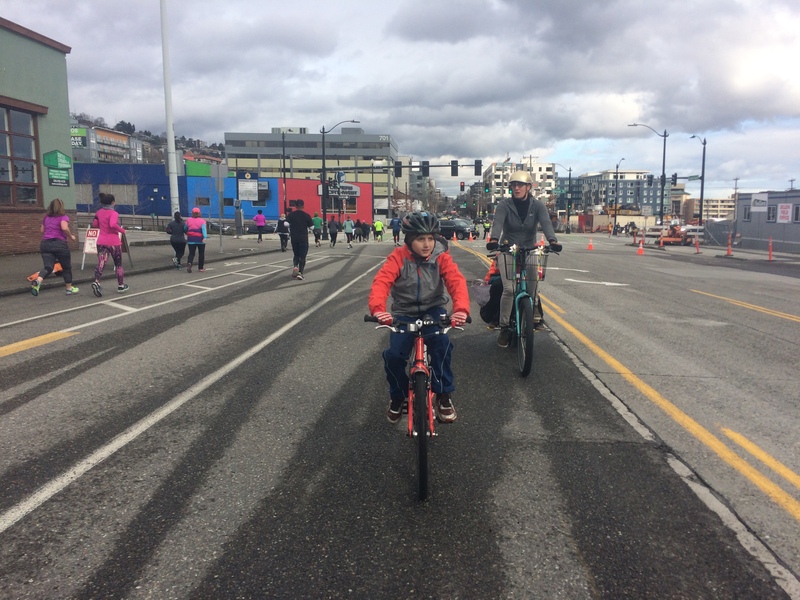 HOWEVER, today was the Hot Chocolate 15k/5k (“Not a Race, It’s an Experience‎”) so most of the blocks of Dexter we biked were closed to cars! It was glorious. Plus we were going against jogger traffic so we could smile at the racers. Walk the Battery is part of the b’End Tunnel public art initiative intended to celebrate the Battery Street Tunnel, in its final years of service. This event, entitled Walk the Battery, will temporarily allow the general public to share a one-of-a-kind walking experience through this ‘auto-only’ public passage–at the threshold of a new downtown waterfront. The out-and-back meant we ran into all our friends and the kids had double the chances to find treasures. The best score was a Thai coin dug out of some hard-packed junk at the north end of the tunnel. There are also several sharp metal bits and pieces lovingly stowed in my bike’s cargo bags, but I was allowed to throw away the squished and very dirty lipstick tube that was presented to me as my special treasure. I hope other kids (and adults) had as much fun, yet also managed to stay cleaner. 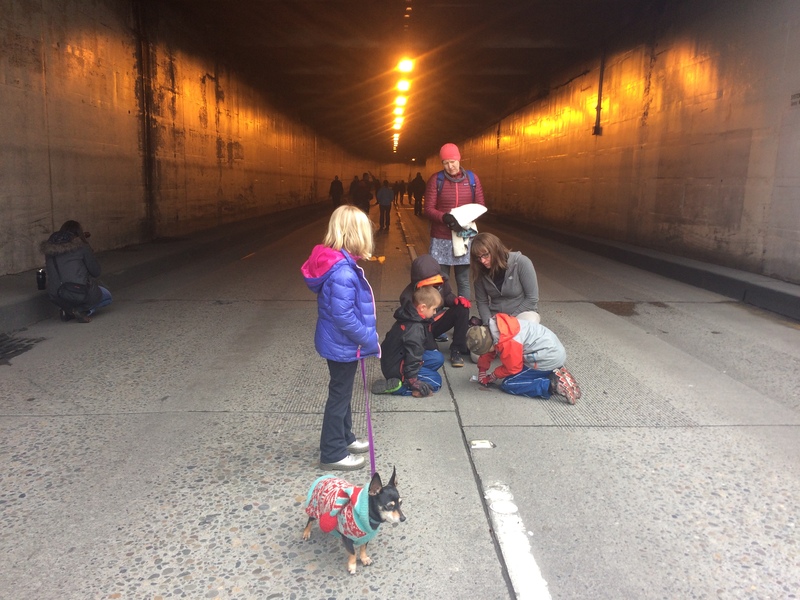 My guys rubbed against the sides of the tunnel and given that it’s normally home to car traffic, it’s dirty. Heading home we had a couple car-free blocks of Bell Street. This was particularly great because Bell Street is one way and there isn’t a comparable street in our towards-home direction. I have high hopes the One City Center plan will fix that someday, but today we took the Bell Street sidewalks to Dexter. The Hot Chocolate 15k/5k street closure was over and the north-bound Dexter bike lane is riddled with big road seams and a long closure so we did a bit of side street zig zagging (route home here). We found some cool streets this way, but they were pretty potholey and my seven-year old wiped out in one of them. Thank goodness for cargo bikes! I collected him and his bike onto my Surly Big Dummy and carried him until he felt up to riding again–close to home before the big hill, phew. p.s. it was very cold today and I can’t wait for winter to be over! 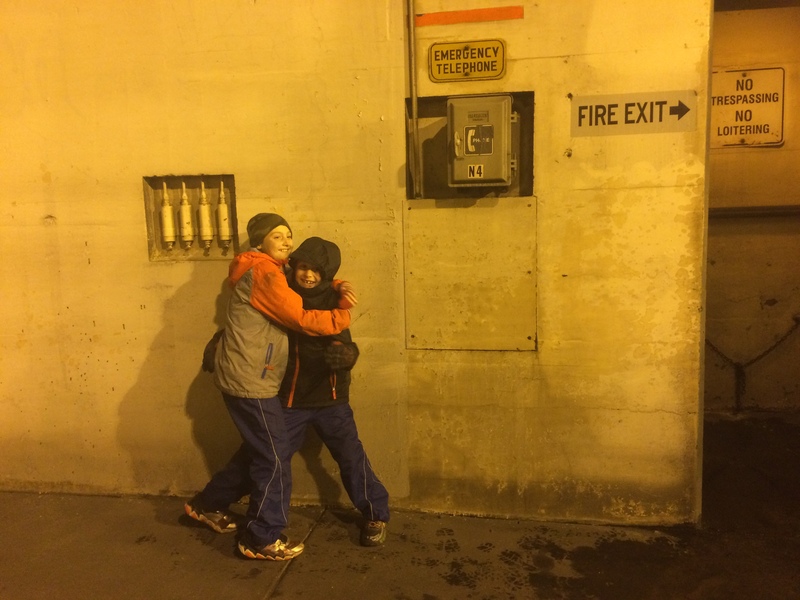 The kids were all troupers, but we all experienced frozen extremities. Thankfully there was barely any drizzle and the wind (one of the Bell Street street-closure barriers blew into an SUV in the middle of an intersection!) didn’t last long–or at least was only down in Belltown. Carfree streets are such a treat. We have been experiencing a lot of frozen extremities on our Baltimore biking adventures too, Spring where are you! This weekend we biked up to Station North with a friend of mine who hadn’t been on a bike in over 20 years to look at all the street art. It was fun to share my love of biking.